By Michael Poh in People. Updated on November 13, 2017 . Founded in 1984, TED is a conference established with the sole mission of spreading ideas. The annual conferences began since 1990 and they have sought to bring together experts in the field of Technology, Entertainment and Design to give talks and make them available to the world for free. Embracing its slogan, ‘Ideas Worth Spreading‘, we’ve collected 5 of impressive TED Talks on technology developments. Some of these presentations are quite long (by our ‘attention span’ standards) but not to worry, we’ve shared the best moments of the videos so you can skip right into the action. Indeed, these presentations by scientists, engineers and designers alike are some of the best we like to share with you and hope that you will spread the ideas among your friends too. Wireless is in, wires are out. That’s the popular sentiment for the last couple of years. Who wants to handle all the messy tangled up wirings of their television set, personal computer and even the chargers for their smartphones? We want to minimize our reliance of wires because they’re an eyesore and they restrict our placement of our electronic devices. And we want to stop fumbling around for the phone charger in the middle of the night because our phones can’t stop beeping for a recharge! Eric Giler has a solution: he’s telling us that we can charge our phone and electronic devices wirelessly. In this video, he shows how wireless charging is made possible with electromagnetic technology. At 7:25 he plugs in the cord to the charging coil, and within 10 seconds the TV which is a distance away from the charging coil starts up (7:40). To understand what is allowing this to happen, watch from 6:30 to see Giler explain how wireless charging works. Using electromagnetic induction, we can now beam electric power through the air and charge electronic devices like the TV or even smartphones (8:35). Artificial Intelligence is not a new concept but it is amazing how far scientists have taken the tecnology to heart. In this video demonstrated by Vijay Kumar, we see small, agile mini-robots that have been programmed to control its own flight movements, without human control. What is amazing about this is that these robots can communicate with another robot and can actually figure out a plan to cooperate with one another to achieve their tasks, without human intervention. Watch these robots fly in formation (10:02), maneuver through obstacles without breaking formation (10:20), build structures in co-operation and building in turn (11:20). These robots can be used to be the first responders to search and rescue operations or exploratory missions, to enter collapsed buildings to search for survivors in areas struck by natural disasters and more. Lastly, there is no end in sight as to what these robots can do. We are limited only by our imagination. As a special treat, go to (15:15) to watch a music performance of the mission impossible theme made entirely by these amazing flying robots. Be ready to be blown away by this 5-minute clip. Johnny Lee shows how he hacked into a $40 Nintendo Wii remote and turned it into a tool capable of serving as a multi-touch interactive whiteboard (2:00). The cheat? Using that high performing infra-red camera found on the tip of every Wii remote and another $10 hardware to get it to work. Using a DIY infra-red pen the Wii Remote motion-sensor camera resting on the projector, and a special software (the ‘hack’ he created) installed, anyone can now use the pen on a projector like an interactive whiteboard. The second demo shows Lee using a pair of safety glasses with two infrared dots. As a result of the coordination between the infrared dots and the camera, it now creates a 3D environment which responds to your head movement (3:50)! Here’s a better (albeit earlier) video that shows the 3D head-tracking experiment in detail. He deserves a standing ovation for his work, which he does get at the end of his TED presentation. Smartphones may get even smarter in future with its ability to recognize objects in real-life and provide additional information to create an augmented experience for users. We’re not talkign about merely scanning QR codes in order to extract texts, URLs, etc, but this presentation by Matt Mills will probably help you visualize it better. Check out how pointing the smartphone’s camera on the sports section of the daily newspaper produces a video of the actual gameplay during a tennis match (2:10) or how you can get a visual guide on how to setup a device e.g. a router simply by pointing the camera at the router (3:00) and how a photo can seamlessly trigger an embedded video (3:30). This is done with the program called Aurasma. You can attach any video clip to any image which when scanned by the program can trigger the video to play. It’s great as an educational tool, an advertising tool for a new movie, or as an inside view to your job just by tagging your company video presentation to your business name card. High-speed cameras can measure over 1000 fps (frames per second), a normal motion picture, 24 fps but with Femto photography, you can capture a whooping one trillion frames per second! In fact, Ramesh Raskar has used it to capture a video of light in motion (2:00) as it passes through a1.5L plastic bottle of water (see below). At 2:55 you get a detailed view of the path of travel the beam of light took in a nanosecond. In comparison, a bullet going through the same path at the same time frame, would take a year to watch at that replay rate. 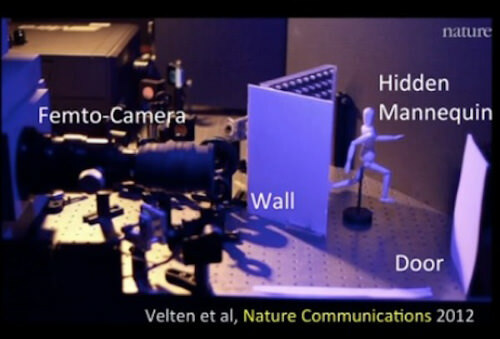 The technology in itself is an amazing piece, but the crux of Ramesh Raskar’s presentation when he demonstrates how we can look around corners using the high-performance camera by capturing reflected photons fired from a laser pulse. The idea is demonstrated in a mini-model of a mannequin placed behind a wall and not within the line of sight of the camera. The Femto camera attempts to capture a visual of the mannequin based on the photons that are reflected off it onto the door (far right). Speed up to 6:25 for a visual explanation that won’t give you a headache. A 3D model of the object hidden around the corner (in this case the mannequin) will be generated based on the reflected photons of light coming from the door. With this we could build sensors in cars that could prevent collisions around dangerous bends, detect the presence of survivors in burning or collapsed buildings, and produce better, non-invasive health-imaging diagnostic tools (say bye bye to X-rays).